Storytelling has always been an important aspect of Indigenous cultures throughout the world. Traditional stories were carefully constructed around the observation of natural events and the plant and animal world, their styles of obtaining food and the history of the people. While entertaining and sometimes charged with emotions, the Indigenous stories influence young people to become knowledgeable and responsible citizens. Central to the cultural and spiritual practices of the Kwakwaka‘wakw people is the potlatch or winter ceremonies when stories are retold, dramatized, and shared. Most of these teachings are passed down through storytelling and the practice of the potlatch—the giving of a great feast. Thus, storytelling is the foundation of traditional Kwakwaka‘wakw education processes. Stories about the plant and animal world continue to be our textbook and curriculum guide. According to Yup’ik scholar Oscar Kwagaley (1995), “In legends and myths, there is always the mention of supernatural beings and the living world,” and he describes most Indigenous worldviews as “seeking harmony and integration with all life, including the spiritual, natural, and human domains” (p. 2). Thus, a Kwakwaka‘wakw worldview is expressed consciously or unconsciously through family and community stories; and by art, dances, ceremonial masks, totem poles and customs. The stories contain the historical events that transform the earth over time and the guiding principles for good relational living that each generation must learn. During special feasts and potlatches, the Kwakwaka‘wakw continue to use many types of ceremonial instruments—whistles, horns, rattles and drums to bring to life our songs, dances and stories (Figures 14.1 and 14.2). When seeing the dancers and hearing the beat of the Kwakwaka‘wakw drum in the bighouse, it is easy to hear the sounds of the Thunderbird, Raven, Dzunuk’wa (the Wild Woman of the Woods) and the Hamat’sa—the dance of the Baxbakwalanuksiwe “the cannibal from the North end of the world” (Figure 14.3). 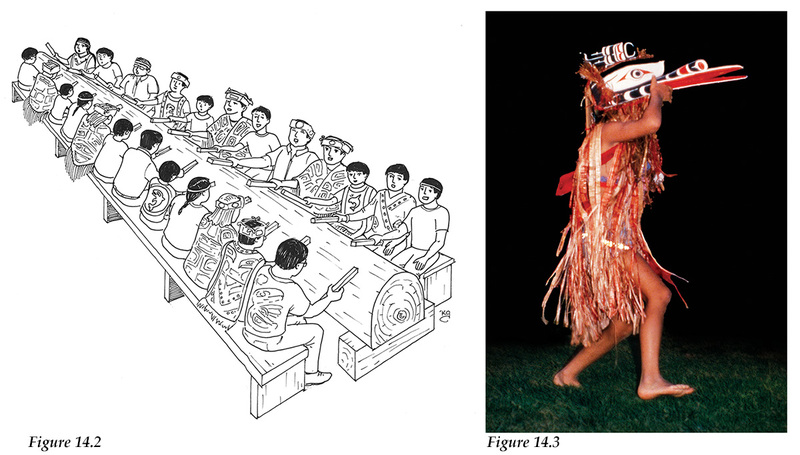 Figure 14.1 ▲ The Aboriginal peoples of the Pacific Northwest continue to use a variety of traditional ceremonial instruments to accompany their songs, dances and stories. Illustration by Karen Gillmore. Traditionally, it was mainly the elderly men who carried the role of drummers given their wisdom and knowledge base. Today there is a revitalization of singing and drumming traditions that is seeing younger men playing a greater leadership role at the log, much of this inspired by “Wa” (William Wasden), a young chief and cultural leader from our territories. 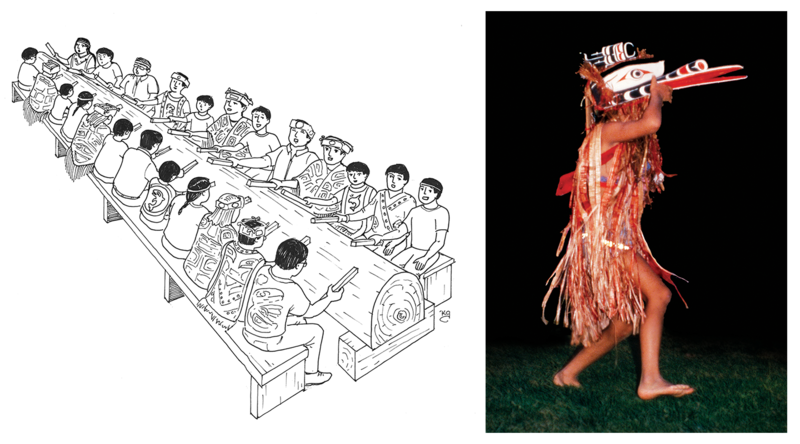 Figure 14.2 ▲ The Kwakwaka’wakw drum is a hollowed out cedar log, and sits up to 12 drummers on either side. Illustration by Karen Gillmore. Figure 14.3 ▲ Kwakwaka‘wakw dancer wearing raven mask during the Hamat’sa—the dance of the Baxbakwalanuksiwe. Photo by Gloria Snively (1985). Traditionally, Kwakwaka‘wakw education involved specific skills that were needed to live and evaluation of learning was determined by the community and simply by an individual’s ability to carry out his or her responsibilities within the group. Life on the land was tough, but it also had a sense of meaningfulness; the lifestyle was healthier as people were more spiritually, emotionally, physically, and mentally connected to the land and each other. People had to co-exist with their environment rather than conquer the land. During the first decades of the 20th century, many of the teachings that embody songs, dances, ceremonies and potlatches were prohibited by federal and provincial laws, and subsequently the Kwakwaka‘wakw were no longer able to give thanks for the things they were given by Creator. Connections were lost with the spirit world, and the people no longer took only what they needed. It has only been within the last few decades that significant attempts have been made to reconnect with our traditional Kwakwaka‘wakw teachings and the knowledge and values these teachings encapsulate. Local traditional knowledge and wisdom has meant life and wealth for the Kwakwaka‘wakw, and continues to be accumulated through time spent living on the land with young people working alongside families and communities. Hence, our traditional knowledge is the science of our people, our Indigenous Science (IS), and has always been interconnected with the land. To separate the two would detach one from the true meaning of IS, which is to live in harmony with the land. The goal then is to create science curriculum that connects us to the land, which is more relevant to our Aboriginal learners who may have previously rejected school science because it conflicted with their cultural value system. Following Snively and Corsiglia, Chapter 6, I use the term IS to refer to the science of Indigenous peoples worldwide. I use the term WS to represent Western Science or Modern Science, the science taught in most classrooms. The inclusion of traditional ways of knowing, our IS with Western Science (WS), brings a glint to the eyes of our grandmothers while it sparks the interest of our children. We seek to inspire and enable our students to access the vast storehouse of our collected and refined observations and understandings while also having access to the language and modes of analysis used by newcomer science and governance. One of the biggest challenges First Nations communities face is overcoming the negative self-images and self-worth that has stemmed from “failure” in the classroom. What could be more encouraging than to learn about the IS that has proven to sustain the Kwakwaka‘wakw in their homeland for hundreds and thousands of years? As a First Nations educator, I wanted to find ways to use our stories in the classroom in order to balance IS knowledge and wisdom practices with WS knowledge and practices, thus making school science more relevant, meaningful, and accessible to First Nations children. I chose the story, Raven Steals the Light, as the focus of my science unit and the catalyst for student learning. Raven, the trickster and transformer, is credited with many heroic deeds, as well as being ridiculed for his greed and gluttony. Raven performed many important tasks in making the world a good place for humans, including releasing the sun that was hidden in a bentwood box by a selfish chief, so that at last there was daylight and people no longer had to live in darkness. The story occurs in many versions and is only one of numerous Raven “creation” stories. In developing a culturally relevant science curriculum, I needed to more fully understand a Kwakwaka‘wakw worldview in order to develop lessons that accurately portray the values and traditions of our people. I also needed to find methods of assessment that are effective and culturally appropriate. From a Kwakwaka‘wakw perspective, what could be more illuminating than seeing how interactions between Elders, children and the land stimulate and draw forth the most meaningful teaching and learning? The community of ‘Yalis (Alert Bay) is located on Cormorant Island, within the area known as the Broughton Archipelago on the mid-coast of British Columbia. Cormorant Island lies within the traditional territory of the ‘Namgis First Nation, one of 16 remaining Kwak’wala speaking nations. Directly adjacent to Cormorant Island, on Vancouver Island, is the mouth of the Nimpkish River (Gwa’ni). The Nimpkish watershed is the largest on Vancouver Island. According to the legend of the river’s origin, Gwa’ni was placed there by Creator to support “many kinds of salmon…food for your descendants for as long as the days shall dawn on the world.” It was these salmon runs that gave birth to the Kwakwaka‘wakw people (see Chapter 13 for a more complete description of ‘Yalis). The student participants in the study included Grade 6/7 intermediate school students at the T’lisalagi’lakw Band School in ‘Yalis. There were 18 participants with a balance of both male (10) and female (8). The students ranged in age from ten to twelve years old and most were of Kwakwaka‘wakw ancestry or from other First Nations. Since my research involved the IS and worldview of a home place, community involvement was essential. The six knowledge keepers I interviewed had dedicated their time to preserving our rich culture through potlatching, speaking our language, researching our history, and being well versed in Kwakwaka‘wakw stories, songs, and dances. The interviews were designed to explore story and its place in Kwakwaka‘wakw education, and to gain a basic understanding of a Kwakwaka‘wakw worldview. The interviews were digitally recorded in video and audio by the ‘Namgis Treaty Communications officer and myself. Thus, I relied on a form of oral history where people had the opportunity to speak in their own words about their life experiences. By having similar backgrounds in relation to home, culture, and education and by listening to the interviewee’s comments, and focusing many questions on the interviewee’s previous comments, an informal feel to the interview was achieved, like an open discussion. Following my interviews, I was able to explore relevant applications to teaching science by incorporating knowledge elements that were and are still taught by the Kwakwaka‘wakw. The research was also based on historical research that relied on archival data stored at the U’mista Cultural Centre Society, located in ‘Yalis. The Franz Boas collection was explored along with the ‘Namgis Treaty collection. Suitable stories were chosen from these two collections, as well as stories shared by the participants. These stories then became the basis for developing my science unit of study. A worldview is a term to describe how one’s beliefs are used to view the world. According to Kawagley (1995), “The concept of worldview is very closely related to definitions of culture and cognitive map” (p. 7). Each person’s “life understandings” take place over time as he or she engages in new events and experiences, and interacts with others, and derives answers to questions about life and living with fellow human beings. “Young people learn these principles, including values, traditions, and customs from myths, legends, stories, family, community, and examples set by community leaders” (Kawagley, 1995, p. 7). Every child comes to the classroom with a worldview that is closely aligned with his or her cultural experiences. Every system of education is built upon some way of looking at life and the world. Hence understanding the concept of worldview is to education what a foundation is to a building. By looking for patterns in the Elder interviews, nine main themes emerged. These themes encapsulated, at least in part, a Kwakwaka‘wakw worldview and are the themes I kept in mind while developing my lesson plans. These rules and regulations are framed as positive duties and obligations and they help ensure that there would always be enough resources for everyone in the community. The Kwakwaka‘wakw way of life and the continuation of life depends on people following these rules that were laid down through story. Alternatively, if these strict laws were broken the stories speak of terrible things that would happen. Significant messages are also found within traditional songs and like so many other oral teachings, they were passed on when it was considered the right time. While we learn from the lessons within a story, we are reminded that the teachings that stick with us the most are often the ones that fill us with communal happiness and laughter. In Kwakwaka‘wakw culture there is mention of several supernatural beings who do not have a physical body, but are able to use their magical powers to transform. Spirits such as Raven were given gifts that allowed them to connect with all things in nature. There are many consistencies found within story and song that illustrate our close connections to nature and to the animal world. We are all part of the same circle of life; we are all connected. If there is no reciprocity the things we rely on the most will no longer come back to us. Maya’xala teaches us to have respect for all things, with the most important being self. Messages of maya’xala are seen throughout Kwakwaka‘wakw stories, legends, songs, and dances. Today anyone who is a part of the Kwakwaka‘wakw culture will speak of maya’xala, it is a term that is used for all things at all times (used in the big house and other teachings, it is spoken to remind children of the need to be respectful). One of the most powerful components of any unit of study involves community, which should be no surprise since the children are the stakeholders. The foundation of Aboriginal worldviews is people’s relationship with each other, across families, communities, generations, as well with their other relatives—plants, animals, fish, trees, birds, killer whales, and all the other elements of creation. By involving community, we add time-tested knowledge and wisdom that is not available in the standard resources we are required to use in schools. More importantly, we bring an enthusiasm and sense of pride that comes from working together towards a common goal. All Kwakwaka‘wakw stories tell about a specific time or place in local history, and provide a view of life prior to contact. Through story, we begin to have a better understanding of the landscapes within our traditional territories and our impact on these lands. More importantly, our ancestors passed on to future generation’s experiences and stories that are rooted within the land. Many people will tell you that it is a different feeling when they are on the Nimpkish Lake or at Woss Lake because they feel they are surrounded by their ancestors. Therefore, it is important to make these connections from our stories to the land and its place in science. As students learn more about their land, they are more likely to have a vested interest in taking care of their land because they have experienced its beauty and rich history. Stories and ceremonies reinforce how one should conduct oneself, and when a student is made accountable for their actions, they are more likely to become responsible citizens. So when Elders entrust a student with the knowledge that has been handed down to them, there is a responsibility that falls upon the student. These responsibilities shape the individual, the community, and even the world. Stories confirm rights and privileges and explain where families originated. Traditionally, it was the responsibility of the parent and extended family members to come together to teach essential life skills and to find peoples’ gifts. It is our family members who shared with us the stories we remember the most. Grandparents, aunties, uncles, and those who were exceptional storytellers, would use as many opportunities as they could to communicate our connections within family and place. The most memorable and teachable experiences often happened within family and the lessons stayed with that individual to carry on to their children and their children’s children. From what the Elders have said, from the historical stories, the vision is simple—to integrate Kwakwaka‘wakw knowledge that has been gathered since the beginning of time through story and ceremony, with Western Science. As the Kwakwaka‘wakw engage in joint ventures these two knowledge bases will ensure that the natural resources and traditional practices of the Kwakwaka‘wakw are protected. many science concepts and processes could be easily drawn from the story; and the story is relevant to the students’ lives. The goal is to acknowledge and strengthen the First Nations Indigenous Science education experience, while simultaneously engaging students in Western Science education experiences so that our students would find school relevant and be successful in the school science program. Additionally, the story could be linked to many prescribed science learning outcomes outlined in the Grade 5 and Grade 7 BC Ministry of Education Integrated Resource Package (2005). From my interviews with respected cultural leaders, it was clear that putting the spirit of maya’xala into all aspects of the curriculum was imperative: the goals, lesson plans, materials, and resources used, evaluation and how students behaved. I was certain that the success of any science program must include spirituality because it is what connects us to all things. The land creates the foundation for what we know as science, so it became important to travel to selected locations within the Kwakwaka‘wakw traditional territories to explore aspects of Kwakwaka‘wakw story, and because many ‘Namgis children had not travelled much beyond ‘Yalis community. Family and community working together became a powerful part of the science curriculum, and the involvement of Elders and community resource persons became its foundation. At the creation of the world, there was no light. The sun and the moon were kept in a treasure box by a greedy Chief who owned the treasure box and would not share it with anyone. 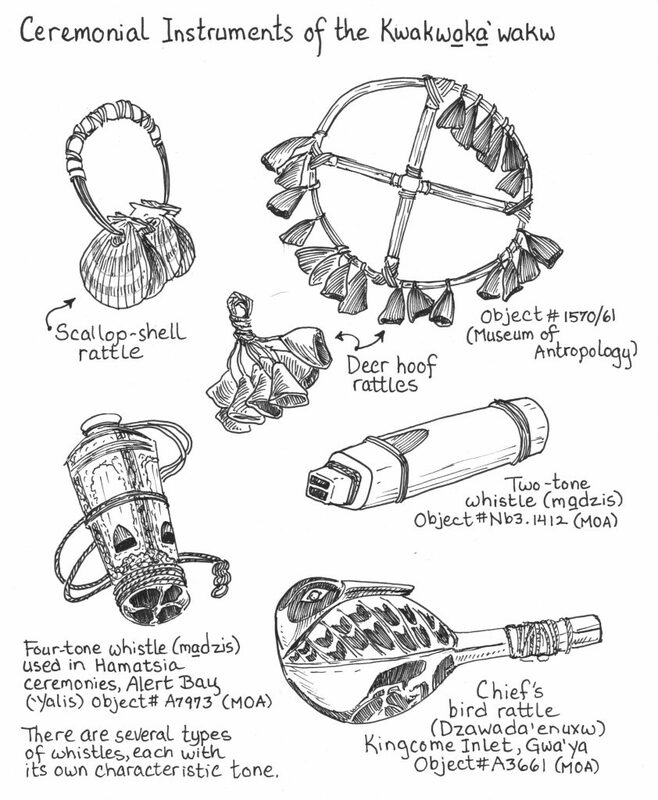 One day, Raven, whose name was Kwikwaxa’wi (Great Inventor) heard about the Chief and his treasures. He heard how bright and warm the sun was. He wanted to have it. So Raven thought about how he could steal it for himself. Raven transformed himself into a salmonberry so that he would be able to trick the chiefs’ daughter into eating him (the salmonberry). Once he is in the daughters’ stomach Raven transforms himself into a baby boy and the chief’s daughter gives birth within four days of eating the salmonberry. Raven grew fast and could talk as soon as he was born. One day, Raven came home crying loudly. His grandfather asked him, ‘What is the matter with you?’ Raven replied, ‘I want to play with the treasure box that hangs from the roof beams’. His grandfather told him very sternly, ‘No one is to touch that treasure box and do not ask again!’ So Raven threw the biggest tantrum he had ever thrown and cried and cried and would not stop. Finally, Raven’s grandfather took pity on him and told his daughter to lower the treasure box. He told her to open the lid just a little for Raven to see. When Raven saw the beams of the sun shining out he started to cry. He begged to play with the box. So, his grandfather allowed him to play with the box only if he promised not to open it. Raven promised and played with the box all afternoon without opening it. Another day, Raven was allowed to put the box that held the sun in the bow of his canoe. Then he paddled away and went out to the sea. When he was quite a distance away, he opened the box just a little bit. Out from the box flowed some bright rays of light. He was really proud of himself that he had stolen the sun and had it all to himself. He yelled back to his mother and grandfather and said, ‘You thought you would have the sun for yourselves and be the only ones to have daylight! Now look who has the sun. It is me, for I am the great Raven!’ He opened the lid a little more and at that moment a wave came and rolled the canoe. Raven fell back in the canoe and the lid fell off the box. The sun came rising up and quickly floated into the sky. It was too hot for Raven to grab. There was nothing he could do. He had lost the sun and daylight was released to the world. 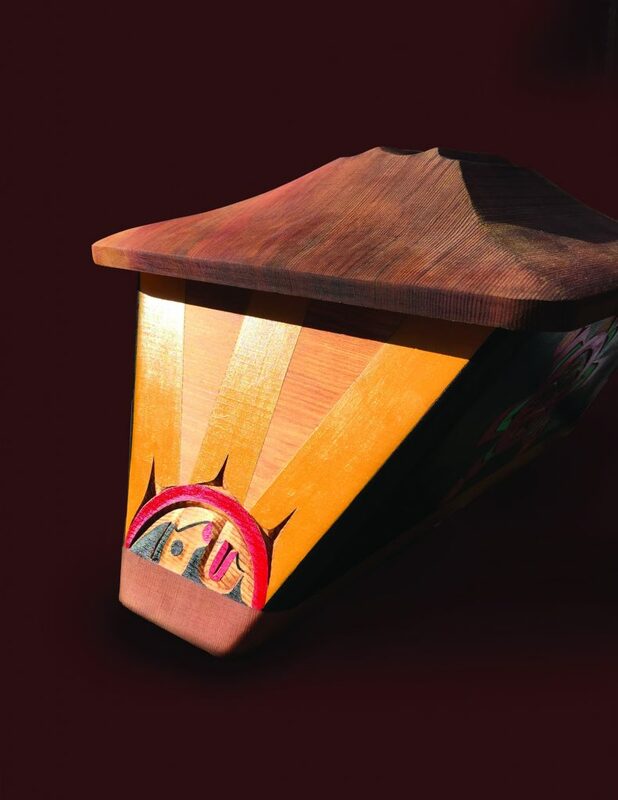 Figure 14.4 ▲ Bentwood box depicting Raven releasing Sun by ‘Namgis master artist Bruce Alfred. Photo by Sandra Seib (2013). Figure 14.5 ▲ Bentwood box depicting darkness replaced by sunlight by ‘Namgis master artist Bruce Alfred. Photo by Sandra Seib (2013). Figure 14.6 ▲ Bentwood box depicting sun taking over the world by ‘Namgis master artist Bruce Alfred. Photo by Sandra Seib (2013). Generally, Raven is a comic figure, but at his best, when he is most evolved, intelligent, and skillful, he rises above all other heroes and actually brings light and life to the entire world. By overcoming the greedy and self-involved chief who kept the entire world in darkness, Raven shows us the obligation that comes with intelligence and clear knowledge of our circumstances. Intelligence is not merely for entertainment; nor is it enough to make ourselves comfortable or even grand at the expense of others. Our obligation is to keep our world in balance and set things right when a wrong is being committed. By engaging our intelligence and acting with perseverance and determination, even the most difficult obstacles and dangerous adversaries can be overcome and harmony can be restored. Thus, Raven shows us how to focus on what is important in matters both very small and very large. At the outset, the students were introduced to definitions of Traditional Ecological Knowledge and WS as they were outlined in the classroom science textbook, BC Science Probe 7 (Chapman, 2005). I also introduced students to the term IS, and how Kwakwaka‘wakw stories are filled with examples of IS knowledge and practice. It was helpful to assess the students’ background knowledge around the terminology that I would be using. I imagine students of all cultures and races struggle with these terms. I informed the students that they would be involved in a science curriculum that would link them to their cultural roots, their traditional Kwakwaka‘wakw territories, and the animal and plant world. Students learned that traditional Kwakwaka‘wakw stories are more than just myths or legends. These stories represent “Kwakwaka‘wakw truths.” It was explained that there are thousands of stories that confirm Kwakwaka‘wakw presence in our traditional territories and these stories teach what it means to live in community and with each other—this is Kwakwaka‘wakw science. Before we started our first out-of-school lesson, I reviewed with the students several important Kwakwaka‘wakw teachings related to values, respect, and behaviour. ‘Waxawidi William Wasden, a high-ranking chief among the ‘Namgis First Nation and respected cultural teacher produced a handout with information he had gathered from Elders in the community (Table 14.1). Kwakwaka‘wakw Teachings were introduced to students as guidelines to follow as they participated in this unit of study and in any experiences in and out of school. Students were reminded that how they behave reflects not only on them but also on their family and the school. Honour your family, whatever you do reflects on them and their teachings. Respect yourself, to respect others you must respect yourself first. Obey your Elders, to gain wisdom you have to listen. Watch what you say, once your words come out you can’t take them back and they will always come full-circle back to you. Speak the truth, if you lie you will be labeled a Tłik̓̕was (liar) and no one will ever believe in you. Do not take what is not yours, if you steal you will be branded as Galut’łikw (thief) and never trusted. Share and give of yourself to family and friends, this is what our culture is based on. Cherish the land, our Ancestors were blessed with it and it has sustained us from the beginning of time. Have gratitude; remember to give thanks especially to our Creator for everything that we have. Friendship, the best thing you can be to someone else is a friend. Digita in Kwakwaka‘wakw Nations means the washing away of shame. To keep students safe and on their best behaviour, cultural teachers shared stories throughout the unit of study that dealt mainly with shame and how ill behaviour reflects badly on the individual, the family, the school, and the community at large. For instance, the shame that the trickster/Raven holds becomes the responsibility of the family. So, when someone shames their family it is the family’s responsibility to wash away the shame by holding a feast and paying people to witness the washing away of shame so that it will no longer be talked about. These lessons found within stories kept our large groups of students (18) on good behaviour and safe as we travelled by boat down the Johnson Straight or hiked throughout the traditional territories of the ‘Namgis. The second lesson took place at the U’mista Cultural Society Museum. U’mista in Kwak’wala means the return of something important. The students gathered in the front space of the building that was built for the return of the stolen potlatch collection of masks and regalia. During a potlatch in ‘Yalis in 1921, the Kwakwaka‘wakw people were sent to jail. Government agents from the federal Department of Indian Affairs confiscated their ceremonial masks and they redistributed the masks to museums and private collectors. The students listened to ‘Waxawidi William Wasden share stories about the mortuary customs of the Kwakwaka‘wakw. As discussed previously, the Raven Steals the Light story could be linked to the mortuary customs of the Kwakwaka‘wakw because Raven stores the sun in a bentwood box. Specific kinds of bentwood boxes were used to store food and household items, for transporting goods in canoes, and as burial boxes. As opportunities arose, William discussed themes around the important concept of respect, and this question and answer period was a natural flow into the actual storytelling. Interestingly, several stories emerged from the discussion. As the students talked about their own family crests (Whale, Double-headed Sea Serpent, Raven, Wolf, and Sun) William shared the origin stories of these crests. He encouraged all of the students to research their family crests further because it gives us our sense of place and origin. After we said Gilakas’la (thank you), the students went to a nearby building to observe the steaming of a bentwood box presentation by ‘Namgis master carver Bruce Alfred (Figure 14.7). Bruce described the steps involved in bending cedar planks and the principles behind steam bending of wood. He then gave a demonstration of the technique he had mastered over years of practice. 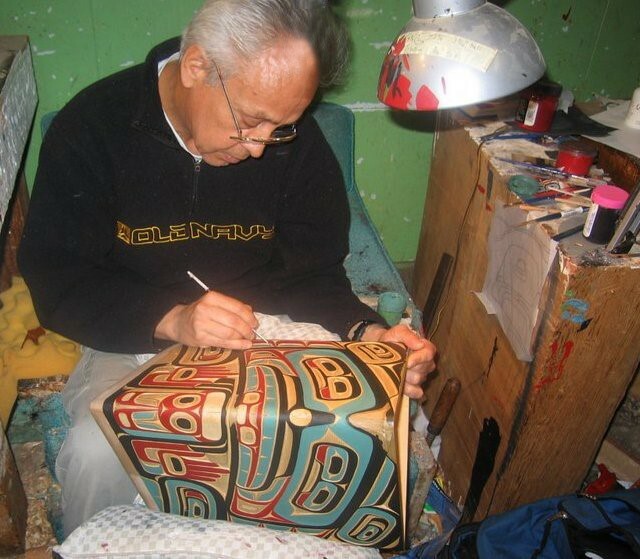 Figure 14.7 ▲ ‘Namgis master carver Bruce Alfred painting a bentwood box. Photo by Irene Isaac (2008). Several weeks later students were fortunate to see a demonstration on the steps involved in splitting cedar planks by David Garrick, a local research scientist (Figure 14.8). He is widely respected because he led the struggle to stop clear-cut logging and saved Hanson Island from environmental and cultural destruction—the Island has the largest number of culturally modified trees in Kwakwaka‘wakw territory. Figure 14.8 ▲ David Garrick demonstrates how to make cedar planks. Photo by Irene Isaac (2008). 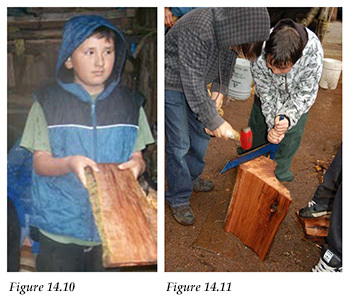 Figure 14.9 ▲ Simple machines used to make cedar planks. Photo by Irene Isaac (2008). Figure 14.10 ▲ Student displays a cedar plank. Photo by Irene Isaac (2008). Figure 14.11 ▲ Students practice. Photo by Irene Isaac (2008). Students planked their own piece of cedar from a fallen tree (Figures 14.9, 14.10 and 14.11). Though a more modern method was employed, these planks were similar to the ones that were traditionally used (Figure 14.12), as illustrated in the book Shaped Cedars and Cedar Shaping (Garrick, 1989). I also taught a lesson discussing the more traditional steps involved in splitting cedar planks by using Stewart’s cedar book as a reference (Figure 14.13). 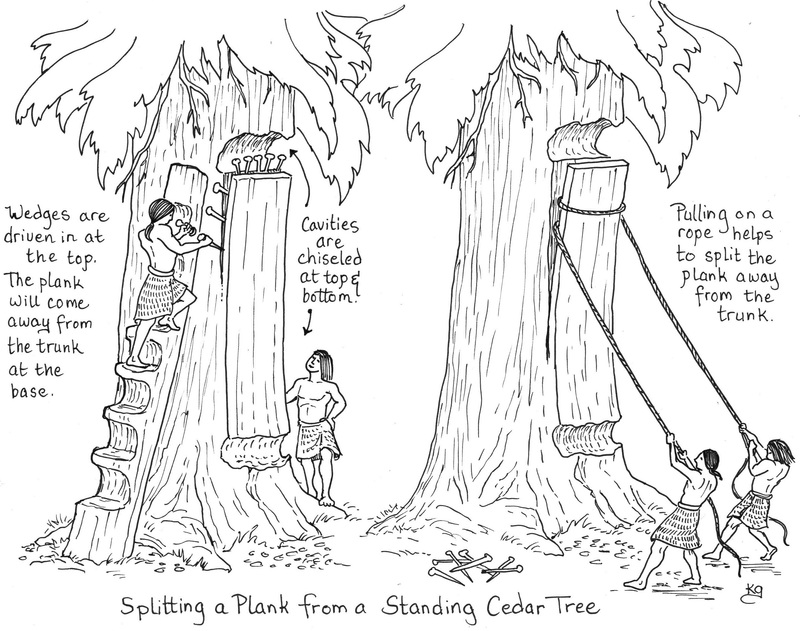 Figure 14.12 ▲ Splitting cedar planks from only one side of the tree ensured a sustainable harvest in the area. Illustration by Karen Gillmore. To complement this lesson we visited the Ecological Park in Alert Bay (‘Yalis) where there are stands of living culturally modified trees (CMT). It was explained to students that these CMTs have been used to confirm our presence in our traditional territories over hundreds and even thousands of years. 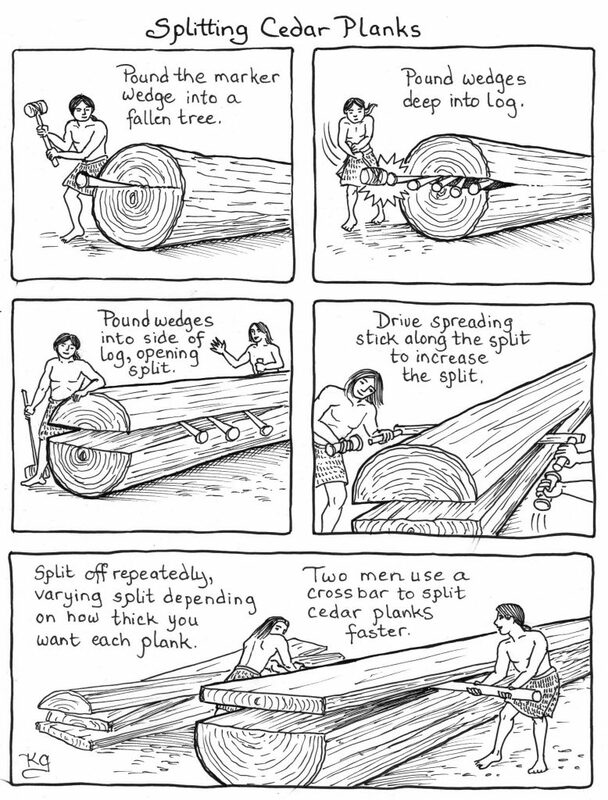 Following our discussion students were asked to list the six steps involved in splitting cedar planks and identify the uses of simple machines: wedge, lever, maul, and crossbar. 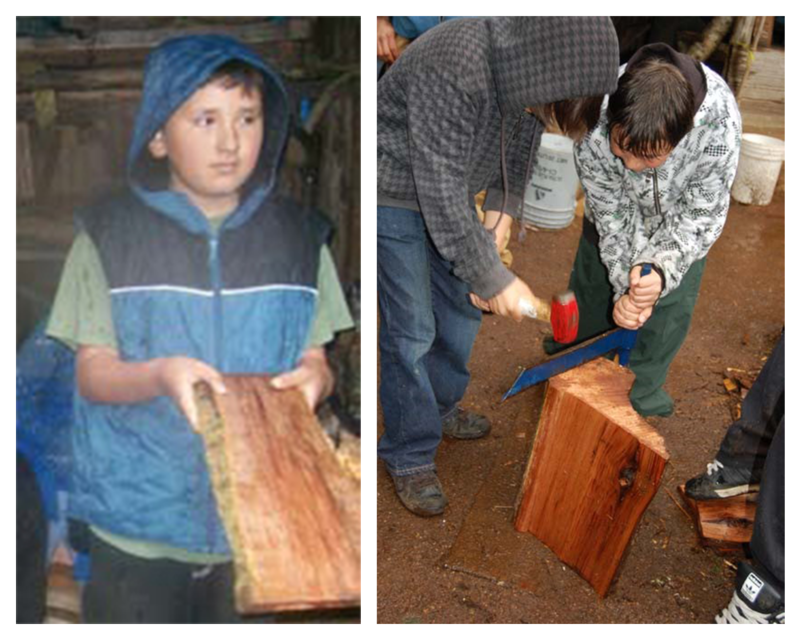 Figure 14.13 ▲ Students’ worksheet on steps involved to splitting cedar planks. Illustration by Karen Gillmore. Our next class involved exploring the procedure of forming a steam bentwood box as outlined in Hilary Stewart’s book titled Cedar: Tree of Life to the Northwest Coast Indians, (1984). Students observed the properties of wood in relation to heat, temperature, steam, expansion, and polymers. The students began art classes with the goal of painting their family crests on the bentwood boxes they made using the techniques that they learned from Bruce Alfred (Figure 14.14). Students reviewed many of William’s resource books to see how master artists put elements together to form a design, noting that many of the designs were symmetrical and showed balance. The students learned about other elements of design––line, colour, and form. Each class began with a demonstration and a step-by-step approach on how to bring the elements together to form designs such as a hand, bear, wolf or whale. Students copied this procedure and were constantly reminded to take their time and put positive thoughts into their art. After the students practiced flat design for six weeks, they learned painting techniques: how to hold the brush, how much paint to use, and how to put the brush onto paper and wood. The completed boxes were later displayed along the runway at the Enjoy Being You fashion show as part of a series of self-esteem activities (Figure 14.15). Figure 14.14 ▲ Students putting designs on their cedar bentwood boxes. Photo by Irene Isaac (2008). Figure 14.15 ▲ Completed cedar bentwood boxes with designs. Photo by Irene Isaac (2008). I started the next section of my unit by handing each student a copy of the story Raven Steals the Light, the version that ‘Waxawidi William Wasden had written down from the oral story that he knows. Up to now the students had listened to several stories relating to the significance and the origin of the sun and the raven, so I challenged the students to think more critically and to think about what the Raven and Sun symbolize to the Kwakwaka‘wakw people. Following the story, we discussed themes that relate to the concept of greed. There was consensus that both Raven and the chief were greedy for trying to keep the sun for themselves. We discussed how the sun was required for life on earth, and that keeping the sun stored in a box symbolized death. Without the sun, there would be no sunlight and the earth would be a dark frozen planet. Though this story required a lot of guiding the students were able to make connections to their previous teachings and identify the importance of the sun as the primary source of life. 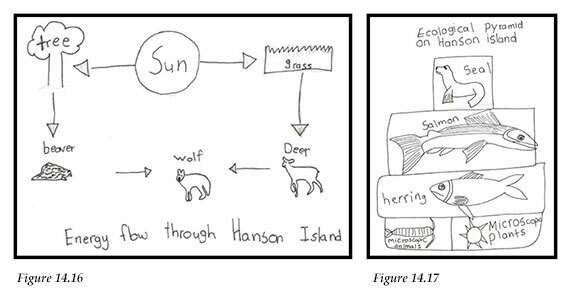 In the next lesson, I introduced the students to the key wildlife species map of Hanson Island and discussed the concepts of predator-prey, food chain, and food energy flow (Figure 14.16). Figure 14.16 ▲ Student’s example of food energy flow (2008). Figure 14.17 ▲ Student’s example of an ecological pyramid (2008). I used a drawing of an orca (killer whale) as an example to illustrate that the materials the orca needs to maintain its body is matter and that the orca itself is made up of matter. I asked the students to identify the wildlife species illustrated on the map, and explained that these wild animals spend most of their time searching for food and they use this food to gain energy. I presented an example on the blackboard to explain that plants use carbon dioxide from the air and sunlight, along with water in the soil, to make food for themselves (photosynthesis) and that some of these animals rely on these plants for food. I used a handout to explain how food energy flows and asked the students to make a food energy flow chart and a simplified ecological pyramid representative of Hanson Island (Figure 14.17). So, in exploring what would happen if Raven were to steal the sun, the students gained a basic understanding of the ecology of ecosystems. This activity linked nicely to chapter 2 of the textbook, BC Science Probe 7 (Chapman, 2005) where students learned about the role of the sun and green plants as energy producers in ecosystems. One of the most important and memorable components of the unit involved our Hanson Island trip, a one-hour seine boat ride down Johnstone Strait. This trip takes place annually in May, as this is when the beach and forest are teeming with life and many stories can be told. As we travelled, Elder and Chief Steve Beans, the skipper of the boat, shared stories in his own quiet way about the land and his lifelong experiences of being on the water. When we arrived on Hanson Island, we held hands and formed a big circle while our cultural teacher Andrea Cranmer gave a prayer of thanks. As we walked up the steep trail to Earth Embassy (the living classrooms of Hanson Island) David Garrick and Don Svanvik (both local experts), identified the culturally modified trees (CMTs), explained their physical characteristics, and how cedar trees were harvested and used for traditional purposes. Students counted growth rings on a CMT and inferred the exact date that the Kwakwaka‘wakw occupied specific areas. David provided detailed descriptions of a wide variety of shrubs and plants and asked the students to identify the names by looking at the labels he had created on small pieces of cedar located in each plant box. These labels listed the WS names of the plants as well as the English names, and some listed the Kwak’wala names. The tour ended with the students engaging in a presentation with Dawn Cranmer about the medicinal uses of plants. Several days later, she also came to the school to show us how to make some of the traditional medicines. In mid-June, the class was invited by the Gwa’ni Hatchery to witness 10,000 sockeye salmon being released at Woss Lake. The main goal of this day was to witness the release of the salmon and to take part in a spiritual ceremony where cultural teacher, ‘Waxawidi William Wasden led us in a traditional song that gave thanks to the salmon. The area in which we released the salmon was an ideal location for harvesting cedar and medicinal plants, which allowed the students to learn the proper techniques and prayers for gathering cedar bark and medicines. One enrichment activity involved identifying animals that live in our traditional territories and the students identified the animal’s English name, Western Science name, Kwak’wala name, and their traditional uses. The second activity was an introduction to plant pressing—where the students learned how to use a plant press. They collected plants and later glued the plants to paper and identified the plants’ Kwak’wala, English, and WS name, for example, nak’wał (salal, English), Gaultheria shallon (WS). It was important for the students to note that the medicines that Kwakwaka‘wakw have been using for thousands of years are similar to the medicines that are used in Western medicine and that many of these remedies came from Indigenous Knowledge. 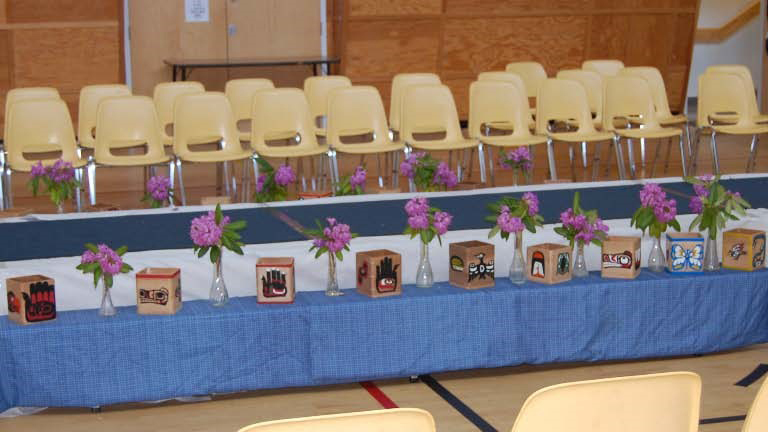 Once the student projects were finished, the students invited their parents to a celebration for the completion of the lessons and to show the displays, including the hand-made bentwood boxes. It was a great way to bring the community into the school and witness what the students were learning from our local knowledge. It was extremely evident that on this day the students were proud to be Kwakwaka‘wakw. Several traditional methods of evaluation were used and several school-based modern methods of evaluation were developed to assess student learning. A major focus of this unit dealt with observation: the ability to listen, observe, and experience the traditional knowledge and wisdom of the Kwakwaka‘wakw. Following many activities students were expected to communicate orally the processes and understandings involved. They learned about the classification of the different types of stories, songs, art, and dances that are used for specific Kwakwaka‘wakw traditions. Students had to keep specific observations and measurements in mind when they made medicines and medicinal teas to boost their energy (using devil’s club, alder, and stinging nettle), harvested cedar bark and made steam bentwood boxes. In the past, these teachings were mastered over years of practice and listening to the wisdom of the knowledge keepers who held these skills. In the past, these teachings were mastered over years of practice and listening to the wisdom of the knowledge keepers who held these skills. As discussed previously, students developed knowledge and skills associated with WS. To name a few: they developed their skills in observing and comparing when they identified and classified plants and animals using their scientific names; counted growth rings on a tree; identified simple machines; observed properties of wood in relation to heat and temperature; created food webs and food chains using pictures and arrows to show the direction of food energy flow; described the process of photosynthesis; and expressed opinions on clear cut logging and resource extraction on Hanson Island. This science unit of study was built on what was already in the community—knowledge, skills, and cultural practices. Lessons focused on Kwakwaka‘wakw identity and gaining self-confidence that comes along with knowing who you are and where you originate. It was imperative for students to work with the community to reach their goals and to celebrate accomplishments. In the past, this is how evaluation took place, and this is why the success rate in this unit was much higher than it tends to be in the standard school science program. Today, in the more recently developed BC science curriculum there is some mention of First Nations and Indigenous Knowledge, but the evaluation standards remain the same. In my unit of study, I did my best to follow the teachings of the Elders and what I felt was a more traditional method of assessment. In most situations I was not the expert so I left it up to the experts (the Elders and cultural teachers) to guide the students and set the standards. The teachers modelled what was expected from the students and they either “got it” or they didn’t, and it reflected in their finished products. Those who had difficulty grasping concepts and skills were given more guidance and those who “got it” were given more responsibility. For example, some students walked away with one bundle of cedar bark while others walked away with four bundles. Observation and respectful interaction seemed to be the most powerful evaluation tools used in this unit of study. I spent most of my time watching students’ complete tasks or getting help to complete tasks. Some of the students may have needed more guidance and support, but all of the students finished several tasks and took part in what was asked of them. So the completed bentwood boxes; the split cedar planks; the completed drawings and charts; the jars of medicine and bundles of cedar; the respect they showed the Elders, plants, animals and the land; the way they resolved disputes; all combined to show me that the students understood the IS knowledge and ways of life of the people. The students also understood and practiced maya’xala, and they understood what it means to be Kwakwaka‘wakw. In this unit of study the lessons explored how the Kwakwaka‘wakw made their living in the natural world. Students experienced and explored the exact territories that their ancestors walked. They were exposed to the beauty of the territories and the stories that were imbedded in nature. There were stories about the trees, mountains, lakes, rivers, rocks, birds, and fish. Stories appeared everywhere, and the students became involved in a process of creating their own stories. As one example, students culturally modified trees by harvesting cedar, and in hundreds of years from now, these trees would tell the story of their presence. Though all of the students heard the same stories their perception of the stories were different, so the students took from the stories the teachings that were meant for them at that time. It was story that educated us about conservation and it was conservation that guided the story. There was little impact on the natural environment because the stories passed down from generation to generation teach us to “take only what you need.” For the lessons, the students took care not to collect too many plants and displayed gratitude to the plants and animals for providing them with food. Kwakwaka‘wakw and many other Indigenous stories speak of something terrible happening when a gift that has been given to us is abused or used in the wrong way. Origin stories tell us that Mother Earth is a gift as well and today we see the terrible things that are happening to the earth as the gift is abused. First Nations education relies heavily on story and as a result the natural world benefits. Something terrible is reflected in loss of the Kwakwaka‘wakw teachings, and is reflected in the continued abuse of land within the traditional territories of many Indigenous peoples worldwide. Kwakwaka‘wakw ways of knowing respected the gifts that were given to us by Creator. Giving prayers of thanks before harvesting cedar or returning fish carcasses back to riverbeds was based on a relationship our people had with the natural world. So as long as there was a display of gratitude there would continue to be an abundance of natural resources. Stories remind us of the valuable relationships and understandings we have with the natural world. I have only touched on the themes that were generously shared with me by our Elders and knowledge keepers. My goal is to be mindful of what has worked for the Kwakwaka‘wakw since the beginning of time and that my lessons are a respectful reflection of the Kwakwaka‘wakw. Boas, F., & Hunt, G. (1908). Kwakiutl texts: Second series. Jesup North Pacific Expedition: Memoir of the American Museum of Natural History, Vol. 10, Pt. 1. Leiden: E.J. Brill. British Columbia Ministry of Education (2005). Science K to 7: Integrated resource package 2005 (IRP 002). Victoria, BC: Ministry of Education, Province of British Columbia. Cajete, G. A. (1999). Igniting the sparkle: An Indigenous science education model. Skyand, NC: Kivaki Press. Chapman, A., Barnum, D., Dawkins, C., & Shaw, W. (2005). B.C. Science Probe 7. Toronto, ON: Nelson Education. Garrick, D. (1998). Shaped cedars and cedar shaping: A guidebook to identifying, documenting, appreciating and learning from culturally modified trees. Vancouver, BC: Western Canadian Wilderness Committee. Mullens, A. (2001, November). Why Aboriginal students aren’t taking science. University Affairs, 8-17. Stewart, H. (1984). Cedar: Tree of life to the Northwest coast Indians. Vancouver, BC: Douglas & McIntyre. Chapter 14 - Storytelling is our Textbook and Curriculum Guide by Gloria Snively and Wanosts'a7 Lorna Williams is licensed under a Creative Commons Attribution-NonCommercial-ShareAlike 4.0 International License, except where otherwise noted.